I was going outside to sketch something completely different — perhaps some yellowing bits of plants in the garden — when the shirts caught my eye. The play of shadows on white are always such a challenge. Treated with a brush that’s too dry, they end up looking wooden, so I tried to keep the shadows and folds loose and wet. This made me smile from ear to ear! The perfect odd subject done with real charm! It’s the kind of odd subject I love painting. Thanks Miz Dee! Wonderful,Shari. 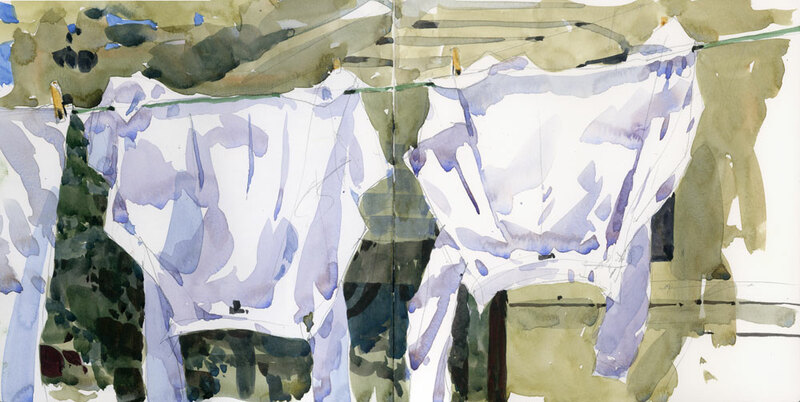 It reminds of a Sargent of white laundry on the line. I’ll never forget that painting and I’m sure you won’t either Linda. Wasn’t it incredible and aren’t you glad you had a chance to see it? I love your confident thick brushwork. May I ask what kind and size of brush do you use? What’s the scale of this art piece? This is done in an 8″ x 8″ sketchbook, double page, so the full size is 8 x 16. I used a #12 and #16 round for this. I can hear the shirts rustling in the wind when I look at this. In fact the sound I heard while painting this was the geese overhead. Superbe! J’ai toujours aimé les représentations de corde à linge et celle-ci est vraiment réussie! What can I say? Shari has the gift ! : ) It’s almost the boundary between abstract and figurative art. Just loved it ! Glad you like it Anders! Love this! Those whites are stunning! The brightness is stunning ! Just stunning, Shari. You have achieved exactly what you wanted with this painting — I love it! i really like this painting, the light is wonderful. 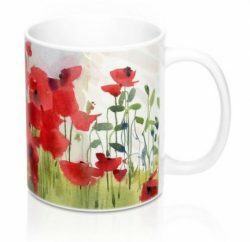 It reminds me of the work of British painter Lucy Willis. I will have to look her up. Thanks for the tip. Have I ever told you that every single time you post a new piece I smile at your words? You always teach everybody so much in just a few words. Bravo! No, I don’t think you’ve ever told me that John. Well maybe once or twice. Merci, mon ami. I love this. I can see them fluttering in the wind! I also love seeing washing on a line and your simple sketch is fabulous. Not only could I hear the flapping of the shirts, I could smell them! My grandmother used to wash on a washboard with Fels Naptha soap, then rinse and wring out the clothes with her hands. The smell of that laundry hanging on the lines as I walked beside her handing out the clothes pegs….heavenly!